On August 3 and 4, the third game of 47th Oui title match between Oui Habu and Challenger Kisei Sato was held in Kobe, Japan. Sato played Sente(Black) and won the game with 1xx moves and the score is now 2-1 led by Habu. You may see and replay the full gamerecord here.. 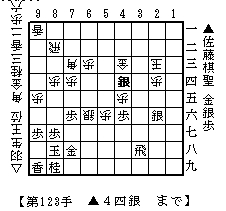 The diagram in the left is a resignation diagram where Sato dropped his Silver on 4d and Habu resigned the game. Although Gote(White) has thousands of pieces in hand, there is no mate for Sente's King and no defense for Gote's King. Here are possible variations after the diagram.